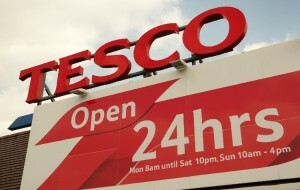 India’s Foreign Investment Promotion Board on Monday approved UK-based Tesco Plc’s proposal to enter the Indian multi-brand retail segment in joint venture with India’s Tata Group with an initial investment of $110 million. After the approval, Tesco will pick up a 50 per cent stake in Trent Hypermarket Ltd, a wholly-owned subsidiary of Trent Ltd, a Tata group company. Tesco is the first global retailer to to venture into India’s $500 billion retail sector after the government allowed 51 per cent FDI in the segment in September last year. Trent Hypermarket runs 16 outlets in the southern and western regions with support from Tesco. The UK retailer plans to sell 14 categories of products, official sources said. The items to be sold at its stores include tea, coffee, vegetables, fruits, meat, fish, dairy products, wine, liquor, textiles, footwear, furniture, electronics and jewellery. India allows FDI in most of the sectors through automatic route, government approval is required in certain sectors sensitive for the economy.